This picture was taken July 25, 2014 @ my daughter and son in-law's home. My son in-law passed away April 16,2017. Was this a warning that something was going to happen or was it something else? Any insight would be helpful. I wouldn't assume that this meant something negative. I don't see the connection in fact, to the death. It is more likely to have been someone's spirit who wanted to be with one or both of you, or as another reader said, "An angel!" I had a haunted house that my family lived in in Oregon and I knew it was haunted because of the things that happened so I started taking pictures and I got the same light in 2 of my pictures, on one it looked just like yours with a see through beam coming down and on the second one I have a picture of the same thing floating across the room and it is shaped like a woman and the beam was her dress I think, it was all see through and you can see her head and body and dress floating in the room. 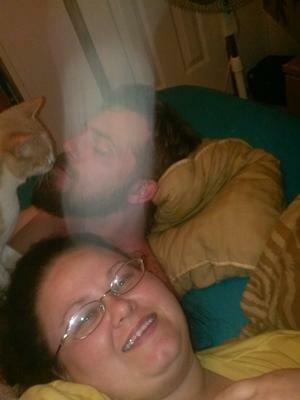 maybe its an angel touching you or a lost relative .